Take a look at the photo. Notice how flat and serene it seems? Well, this scene is where most drownings occur. It’s not the big surf or rip currents…it’s knowledge and know how for the inexperienced. ANDREA SPERLING VIA GETTY IMAGES. An Australian man drowned in Hawaii on Thursday, the state’s third tourist death in as many days, highlighting an ongoing safety issue in the islands. 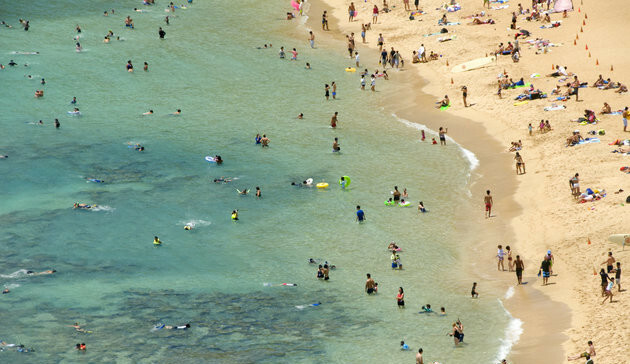 On average, nearly one tourist dies a week in Hawaii, according to a special report by Honolulu Civil Beat, typically while engaged in common vacation activities such as swimming, snorkeling and hiking. Many more suffer serious injuries, including spinal cord damage. Critics say the state doesn’t do enough to warn its 8 million annual visitors of inherent dangers, especially those involving water. All three of this week’s deaths appear to be water-related. On Tuesday, a 27-year-old visitor from Japan died while scuba diving off the island of Oahu. Tatsumi Umemura became unresponsive in the water, an Emergency Medical Services spokeswoman told the Honolulu Star-Advertiser. The cause of death hadn’t been determined. A Chinese tourist, 21-year-old Mei Jun Huang, was pronounced dead Tuesday after sustaining injuries on a waterfall hike in Maui. She was reportedly found by fellow hikers submerged in the waterfall’s pond, according to Maui Now. A 70-year-old Australian snorkeling off Anini Beach on Kauai on Thursday was found floating face-down 20 feet from the shoreline. The victim’s identity wasn’t released. Hawaii’s rate of drownings per visitor (5.7 per 1 million visitors) is 13 times the national average, according to Civil Beat, and 10 times the drowning rate for Hawaii residents. It dwarfs the visitor-drowning rate of other beach states, including Florida, where there are 0.9 drownings per 1 million visitors. Vital Voices “One of these days our city will have serious talks about what needs to be done to lower these types of accidents. As far as the ocean goes, I’m all for videos and websites but the real solution is for the city to invest in improving on their lifeguard services. Improving what we have and expanding our scope. Especially the hours on duty. Surfed Sandys this morning and there was tons of people there locals and visitors alike, and it’s cranking! No lifeguards. One of, if not THE most dangerous beach in the state. Absolute shame that it’s like that. I’m confident that our powers that be will work hard to make this happen tho. It’s definitely a must, at least to some degree. If not these tragedies will continue. No doubt. Every year more and more tourist come here, yet our department doesn’t grow with the times. There’s a culture change coming i can feel it. The public deserves it….” Eugene T. Lifeguard.